Banh mi fixiings: Sri Lankan Black Curry Chicken (foreground) and Citrusy Red Cabbage Pickles (back). Banh Mi has been a touchstone in my life. It all started years ago when I was part of a team of reporters at the San Jose Mercury News covering race and demographics. As part of our — ahem — research of various cultures and communities, we naturally tried to hit up as many ethnic restaurants at lunch time as possible. After all, what better way to learn about a culture than to immerse one’s self in its cuisine? The first time I encountered the ubiquitous Vietnamese sandwich otherwise known as banh mi, I admit I was dubious. A fresh, satisfying sandwich for under $4? How could that be? My low expectations matched the low price. Of course, one bite was all it took to prove me wrong. The sandwich was miraculous. A fresh baguette filled with lemongrass chicken, smooth pate, hot chiles, fresh herbs and the most deliriously wonderful slivers of pickled carrots and daikon. It was savory, fragrant, tangy and bright. It wasn’t a ginormous sandwich by American standards, but it was full of so much flavor and texture that it left you completely satiated. What a bargain, too. In fact, my colleagues and I were so amazed at the bang for the buck that we jokingly started using the banh mi as our own personal form of currency. The cost for the city of San Jose to add resources to its gang prevention efforts? That would be $3 million. Or as we liked to think of it: nearly 1 million Viet sandwiches. Building the BART extension to San Jose? Politicians might call it $3.2 billion. We likened it to about 1 billion Viet shredded pork sammies. Yeah, that’s how we rolled. 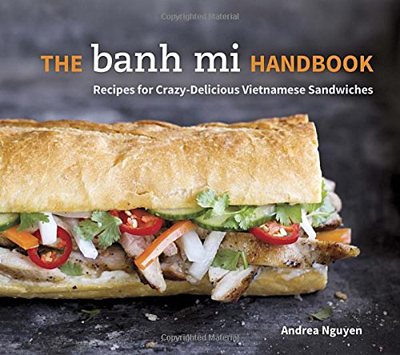 My friend Andrea Nguyen’s newest cookbook, “The Banh Mi Handbook” (Ten Speed Press), of which I received a copy, brought back all those zany and delicious memories. I’d never tried making my own before. The beauty of the book is that it offers so many options. Want to do the whole shebang? 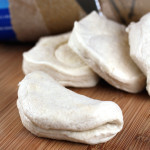 Nguyen gives recipes not only for making various pickles and fillings such as crispy roast pork or edamame pate or headcheese terrine, but even for baking your own perfect banh mi bread from scratch. Pressed for time? Then, just buy the bread. As Nguyen so rightly says, now’s not the time to hunt for the crustiest hand-made artisan loaf. 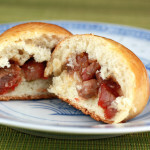 Nope, for a banh mi, an average supermarket French roll is more than fine. It’s actually the perfect texture — sturdy enough to hold all the fillings, but squishy enough to envelope them so everything doesn’t go gushing out the second you bite into the sandwich. 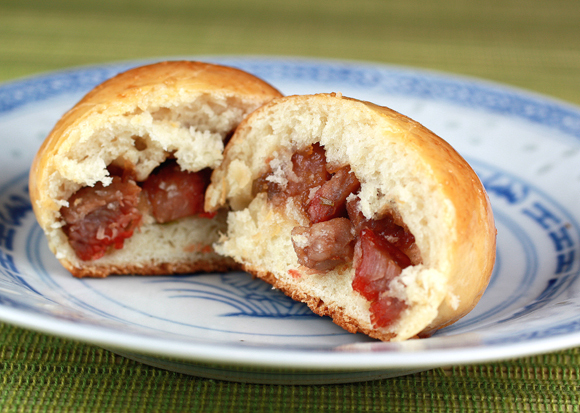 She tells you how to switch it up, too, by using little slider rolls or steamed buns instead. Or make open-face sandwiches with grilled or toasted crostini instead — perfect for a buffet or summer afternoon party. Having long been a fan of Chef Alex Ong’s cooking when he oversaw Betelnut restaurant in San Francisco, I couldn’t resist trying the filling recipe for “Sri Lankan Black Curry Chicken.” The recipe is from Ong; but Nguyen added her own touch by shredding and crisping up the meat in its own sauce. As her husband says, it’s a little like curried chicken carnitas. 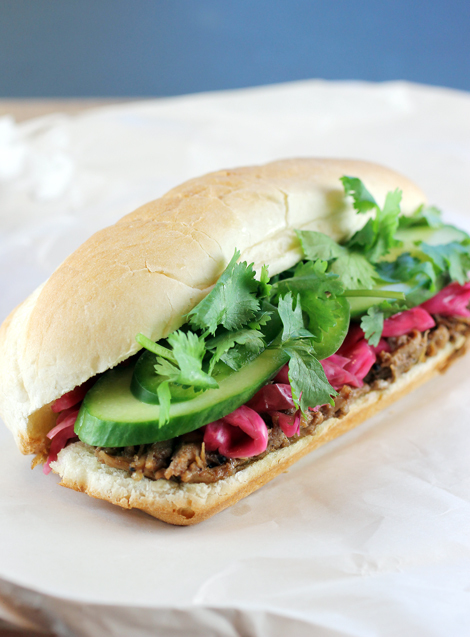 A banh mi that’s a riot of flavors and color. The chicken cooks up incredibly aromatic from the additions of toasted cardamom, cinnamon, mace, clove, cumin, coriander, garlic, ginger, brown mustard seeds and lemongrass. It all simmers in coconut milk until the chicken is cooked through. Lift out the chicken until cool enough to shred. Meantime, reduce the coconut curry until thick. Add the meat back in and continue cooking until the meat and sauce become one. 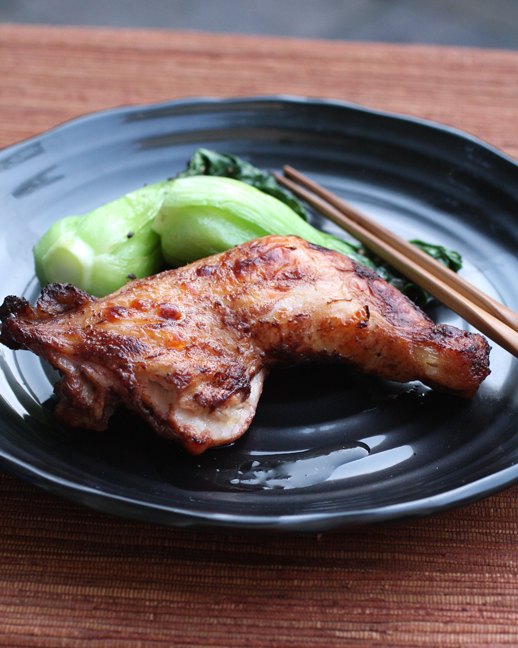 The chicken ends up really tender and quite rich from all that cooking in fat from the coconut milk. That’s why you need some perky pickles to cut through all that. While Nguyen offers a range that will work well in this sandwich, I chose the “Citrusy Red Cabbage Pickle” for its vibrant magenta color. It couldn’t be easier, either. Just heat up distilled vinegar with water, salt and sugar. Then, pour it over shredded cabbage. Tuck in some citrus peel and cap the jar once everything has cooled. You’ll want to make the pickles the day before you plan to make your sandwiches because their flavor really peaks after sitting in the fridge overnight. Then, it’s just a matter of toasting the bread, spreading on a little mayo, then adding a layer of the curried chicken, then some of the pickled cabbage, followed by slices of fresh cucumber, some cilantro, and thin slivers of jalapeno, if you like. Tuck everything inside and enjoy. It’s phenomenal. It doesn’t taste like any $3 sandwich I’ve had. Rather, it tastes like a million bucks. Or better than about 333,333 regular Viet sandwiches all in one. 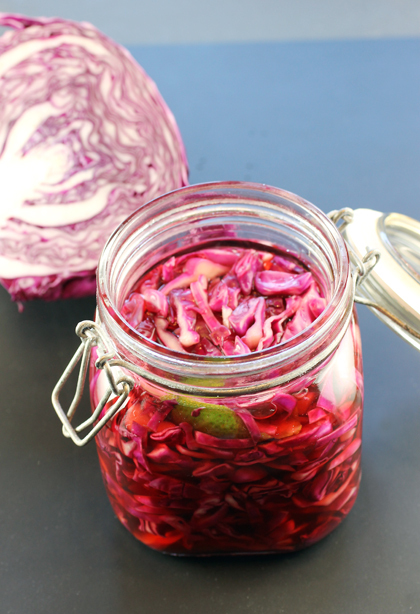 The freshly made pickled cabbage. In a small bowl, combine the cardamom, pepper, cinnamon, mace, cloves, cumin, and coriander. Set the spice blend near the stove. Use a mini or full-size food processor to finely chop the garlic, ginger, lemongrass, chile, and shallot. Keep by the spices. Trim the chicken of large fat pads and set nearby. In a 4-quart pot, heat the oil over high heat. When hot enough to sizzle a mustard seed upon contact, add all of them. Swirl or stir for about 10 seconds, until a few seeds crackle and pop, then add the shallot mixture. Cook for 3 to 5 minutes, stirring, until no longer raw smelling. Lower the heat slightly, add the spice blend, and stir for about 30 seconds, until toasty and a dark chocolate color. Add the chicken, turning to coat with seasonings. Add the salt and coconut milk, which should barely cover the chicken; add water if necessary. Adjust the heat to simmer, uncovered, for 30 minutes. Stir occasionally to prevent scorching; the pot contents will shrink to roughly half the original volume. Remove from heat and let cool for 20 minutes. Transfer the chicken to a plate and hand shred, with the grain, into pinkie finger-wide pieces; set aside. Pour the sauce into a large nonstick skillet. Over high heat, vigorously simmer for about 6 minutes, stirring frequently, until reduced by half and pools of coconut oil dot the surface. Lower the heat slightly, then add the chicken and any accumulated sauce. 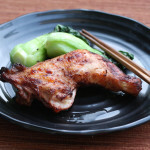 Cook, stirring frequently, for 8 to 12 minutes, until the chicken has darkened to a rich brown and is coated with crusty seasoning; the sauce will no longer be visible and the chicken will gently fry in hissing oil. Cool slightly, then season with extra salt, if needed. For great flavor, enjoy the chicken slightly above room temperature. To assemble your sandwiches: Toast your French roll lightly. Let cool before using. 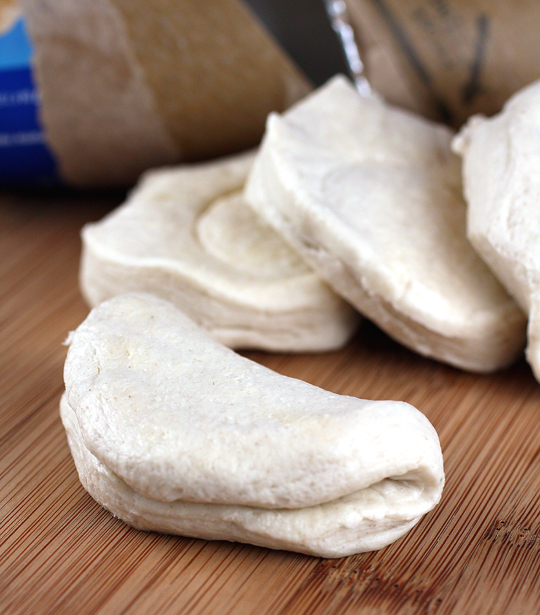 Use a serrated knife to slit the bread lengthwise, leaving it attached on the back side. Use your fingers to remove some of the insides from the thickest half of the bread. Or not. It’s entirely up to you. Spread a little mayonnaise on each half of the bread. 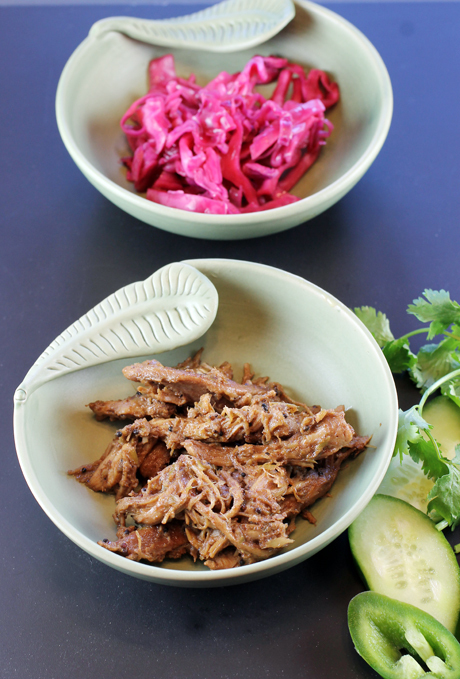 Add a layer of the curried chicken, then the pickled cabbage, cucumber ovals, coarsely chopped cilantro sprigs and jalapeno slices. Note: Curried chicken can be refrigerated for up to 3 days. Reheat in a microwave oven or a skillet over medium heat, with a splash of water to moisten and refresh. Put the cabbage into a 4-cup jar, packing it in as needed. In a saucepan, bring the salt, sugar, water, and vinegar to a boil; stirring to dissolve the solids. Remove from the heat, wait for the bubbling to subside, then pour into the jar. Tuck in the citrus peel. As the cabbage softens, use a spoon to push it down to immerse it all in brine. Leave at room temperature, uncovered, to wilt the cabbage and cool. It’s ready to use once cooled, but will develop more of a citrus edge if capped and refrigerated overnight. Store in the fridge for up to 2 months. Note: Briefly drain what you need in a mesh strainer before putting it into banh mi. If the peel comes out with the cabbage shreds, just put it back in. Substitute other kinds of citrus peel, such as orange and tangerine, to vary the flavor, or add a couple of cloves to the brine. You can refresh the pickle with new strips of peel. After a pickle has matured, taste, and if needed, fine-tune things with extra vinegar or sugar. Let it sit for 1 or 2 days, retaste, and note your changes for future batches. As you use up the cabbage, repurpose the brine for salad dressing. I like to use it for a raw kale salad by massaging the hand-torn green with several spoonfuls of the brine along with salt and pepper to taste. After the kale softens, I add a whisper of grapeseed oil. A fabulous banh mi. I particularly like that pickle. I love banh mi! And yes, I feel lucky to live near Chinatown so I can just pick up the Vietnamese French rolls from the local bakery instead of baking my own. I have to hunt down Andrea’s book to get ideas for the filling! Banh mi sandwiches are so good! I have never heard of bank mi, but they sound wonderful, and absolutely packed with flavor. Thank you for the introduction and for the information about the book. I am intrigued. Andrea has such great recipes so I’m sure the new book is a mega hit! Oh I have never had banh mi but I think now I want to! I have been tempted to sign up for Andrea Nguyen’s class on Craftsy and can see that I must. It took me a while to warm up to banh mi. My first experience was my senior year back in the late 80s. While out with skater friends, one of them suggested a nearby mom and pop Vietnamese shop for sandwiches. Many of us were hesitant, but couldn’t overlook the price. Nonetheless the price didn’t meet expectations and we quietly disposed of bites into napkins. Fast forward to SJSU and a classmate and I headed over to Dakao for ‘dollar sandwiches’. I declined after remembering my senior year. That said it wasn’t until Helen’s Pho in Fremont where I seen the most magnificent sandwiches I ever seen. These we’re huge and gloriously stuffed with meat and veggies. The interplay of crusty fluffy baguette, eathereal pate and bbq pork and pickled daikon and carrot was nothing like the ones I had before. Truly a transition. If anything, I would credit SJSU for the proliferation of banh mi and the many alumni who ate them back in the day as students.